My host system is Win7 64bit. My notebook has 1920x1080 native resolutions. I’m running VMWare Workstation 8 for desktop virtualization. Today I’ve installed Ubuntu 12.04 Beta2 as a guest. I was unable to set 1920x1080 resolution on the guest side. The gnome-control-center display command offered me a lot of other resolutions, but 1920x1080. 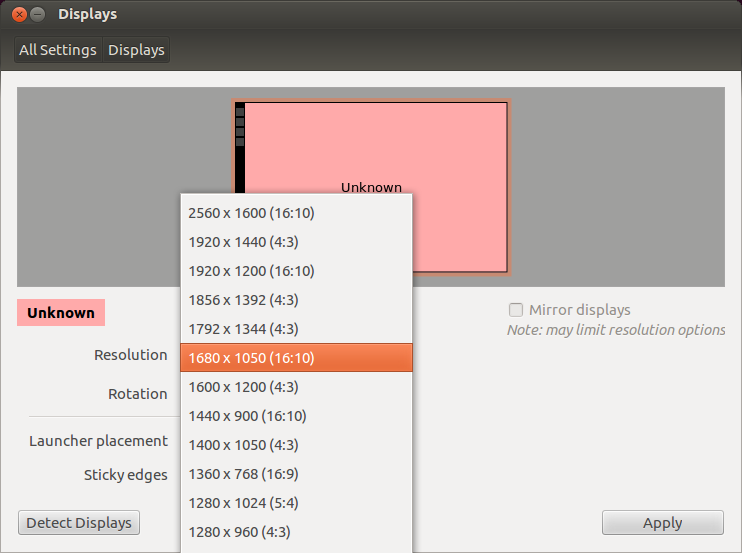 I have to say my Ubuntu 11.10 works like a charm, so for that version the 1920x1080 not a problem at all. If you need more information to fix this problem, I’m glade to help you. Here’s a screenshot about the absence of the 1920x1080 resolution. As you can see I’m unable to choose the mentioned resolution. thank you for your bug report, does the "xrandr" command line let you use that resolution? I don't know if this is a bug in Xorg, or in VMWare. Same problem in Arch Linux. No 1920x1080 output at all. So... VMWare or Xorg? Which one is the bad guy? I am using the final release of Ubuntu 12.04, 32-bit version. I used Display to connect my second monitor. It correctly identified my second display as a Visio 22" M220VA. It displays true 1080p (1920x1080) resolution. But when I try to select this resolution for my montior, it is not an available option, although I can scroll up into a blank area when I suppose other resolutions should be listed. I try to select one of the available lower resolutions and I instead get some out of range error, or something like that. I know nothing about VMWare or Xorg. This is just a standard installation of 12.04 LTS. I was able to use this second monitor under 11.10. I have connected to this second monitor through a VGA analog cable. A workaround: don't focus on getting the 1920x1080 entry show up in the menu. Unmaximize the vmware window, with display properties opened. Then on resizing your window, first note that the resolution is auto-adjusted to a smaller resolution. Next, maximize the window and it should autoset it to 1920x1080. This worked for me, so try it out. I can confirm this bug. I have it on Ubuntu 12.04 and Mint Maya. I can also confirm the workaround from above. For me it was enough to simply switch in my VMware display settings to "autofit guest". As soon as I maximize I am in a real 1920x1080 resolution (in the display settings in Linux it also says 1920x1080 but it is not possible to safe this as default - or at least it doesn't work - or apply it). As I really don't like the "autofit guest" feature I hope this will be patched. Any information on a better workaround would also be appreciated. Karan Batra's workaround didn't work for me (VMWare Player 4.0.4 and new install of Ubuntu 12.04 64Bit). What did was using the Xconf settings editor (Aplication Menu->Settings->Settings editor), setting the resolution by hand and then using Settings Display (the newly created resolution appears at the top of the list) to set the resolution. Addendum to #15: I forgot to mention that I also had to reinstall VMware tools. I also was able to also achieve to add 1920x1080 permanently in Mint by editing the x.org configuration. Apparently there is no such thing like a Xconf settings editor (or at least I haven't found anything) in Mint so Simon's way isn't working. But what did was following this tutorial http://community.linuxmint.com/tutorial/view/877 only with the command "cvt 1920 1080" and than the modeline generated by it. I also had the problem that after "sudo service mdm stop" everything (also the command line) blacked out completely, another Ctrl+Alt+F1 brought the command line back for me. I have temp fix for that. If this is ok for you, here is the configured xorg.conf in the attachment. I was having the same problem with resolution being limited to 1600x1200. Turns out that in the VM settings I had "Specify monitor settings" with one monitor specified and "Maximum Resolution of any one monitor" set to 1600x1200, which is the largest resolution listed. Once I set it to "Use host setting for monitors" (can only be changed with VM powered off) and restarted with the VM maximized it set itself to 1920x1080. I don't think this is an issue with xorg but with VMWare Workstation 8. Also effects Ubuntu 12.04 LTS (32 bit) on VMPlayer version 5.0.0. I can confirm karanganesha04's workaround worked for me. Are you sure that this does actually set the resolution and not only stretches whatever resolution is actually set to cover the entire screen? ...at least this is what happens for me when I try your method. As for the xorg.conf fix: I had no luck with that as neither it does exist on my machine nor was I able to create one properly. The attachment "Temp fix for 1080p res vmware ubuntu guest that missing" of this bug report has been identified as being a patch. The ubuntu-reviewers team has been subscribed to the bug report so that they can review the patch. In the event that this is in fact not a patch you can resolve this situation by removing the tag 'patch' from the bug report and editing the attachment so that it is not flagged as a patch. Additionally, if you are member of the ubuntu-reviewers team please also unsubscribe the team from this bug report. Jesus Canonical. Just give us a Xorg dev for 15 minutes so he can fix the problem. Just to confirm, creating an xorg.conf as attached by the #patch from intel (dts-dreamer) worked for me. I don't know if any (other virtualized) hardware is (negatively) affected by simply using this xorg.conf ...but setting 1920x1080 is now available under display settings and works. Initially I was the person who reported this bug. So I would like to confirm xorg.conf which attached by intel (dts-dreamer) works for me as a workaround. Now I can use 1920x1080 resolution in my VMware Workstation 9 with Ubuntu 12.10.
a) The resolution 1920x1080 is still there thanks to the xorg.conf by intel (dts-dreamer) and can still be selected and set in the display settings. b) However, whenever I restart, the resolution is put back to 800x600 and I have to manually set it each time. This might not be directly related to this bug. But if someone had an idea / fix for this or something pointing me in the right direction, please share. Note that the xorg.conf only works in Kubuntu and Ubuntu. In Xubuntu it crashes XFCE. So the bug is still there, but the workaround works in some Ubuntu-flavors. Still, Canonical should patch the issue. We are almost at 13.04 and the issue is STILL in Ubuntu. It's interesting that even latest Linux 3.10 doesn't have 1920x1080 in there! Could someone push for this extremely common mode to be included in the kernel? totya, this bug was reported a while ago and there hasn't been any activity in it recently. We were wondering if this is still an issue? If so, could you please test for this with the latest development release of Ubuntu? ISO images are available from http://cdimage.ubuntu.com/daily-live/current/ . Now I use Ubuntu 13.10 on a VMware Workstation 9, and it works perfectly. It hasn't an issue anymore. You can close the bug report. totya, this bug report is being closed due to your last comment https://bugs.launchpad.net/ubuntu/+source/xorg-server/+bug/969154/comments/33 regarding this being fixed with an update. For future reference you can manage the status of your own bugs by clicking on the current status in the yellow line and then choosing a new status in the revealed drop down box. You can learn more about bug statuses at https://wiki.ubuntu.com/Bugs/Status. Thank you again for taking the time to report this bug and helping to make Ubuntu better. Please submit any future bugs you may find.